Let yourself be tempted by our selection of french gastronomic specialties, such as foie gras, patés, fine wines, olive huile and chocolates. Our sumptuous gourmet gift baskets and food hampers are the perfect corporate gift for Christmas and New Year's, as well as for friends and family. 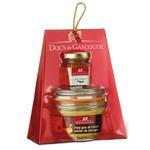 Fine gourmet foods are a treat for everyone all year round. Buy your gifts on line at the Sun Factory. You will find original gift ideas for all occasions and for everyone: a for mom, a toy or plush animal for a child for Christmas, an original gaget for a teenager, a bithday present for your wife, a gourmet gift basket with foie gras for your mother-in-law for Christmas, a personalized gift, gifts for lovers, a gift for dad and little inexpensive gifts for friends. Pour vos cadeaux de naissance, soyez écolo avec de produits en coton bio 100% organique. Idée cadeau.